The young students in my care are full of personality, curiosity, energy and imagination. Many of them (if not all) are young scientists and explorers already. The challenge is harnessing their energy, holding their attention and inspiring them with what I have to offer. 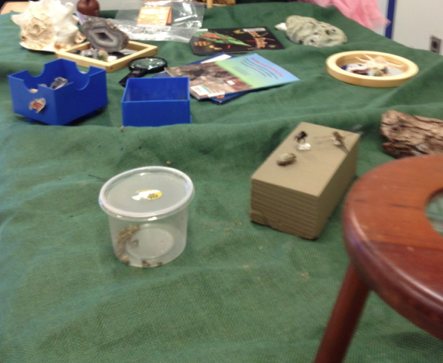 From September to December, I taught science as a focused, hands-on lesson of a concept such as colour or habitat, read books on those relevant themes, and offered a science choice during our centre time. I believe that this is a relatively common approach to science in primary. The children showed interest during our science times and some visited the science centre choice, but I just wasn’t capturing the energy and interest that I witnessed on a regular basis during unstructured playtime. Puddles, forts, dirt, lego, cars, poop, outer space, worms, spiders…my young students study, test and discuss these kinds of topics with gusto, and not necessarily when it is convenient for teacher. I chose these area because I felt confident that I could gather up a sufficient amount of relevant stuff to play with. I first thought that I would create a series of activity cards to go with each station and pictured myself using a handful of parents or older students to help lead the activities. However, this means complicated scheduling. It also means heavily structuring the play that occurs, which of course means that it is not true play. In the end, I designed each station with a natural and obvious play focus. I just set them up and let the kids loose! So far, my children love science playtime. It was so much fun unveiling the centres for the first time. So many new things to explore and do! My task now is to maintain enthusiasm and to make the children aware of their scientific behaviour so that they might play with purpose. I am going to write a series of posts on each station both to help me reflect on what I am doing and to help anyone else who might want to set up their own science centres. So…there you have it. A first step back into blogging.